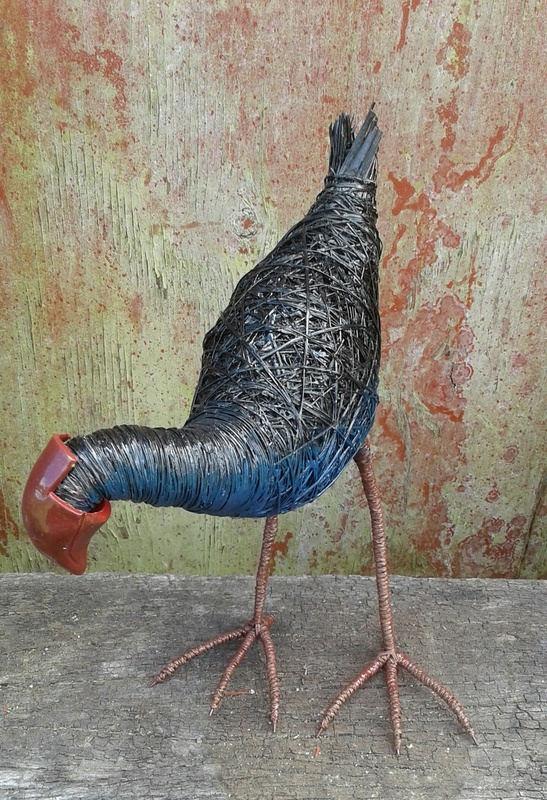 Our interpretation of the pukeko has become very popular over the 16 years we have been making them. He has a sturdy wire skeleton which is skillfully wrapped in flax then painted and a beak made from modeling clay. He is finely balanced as if he is about to scoot out of reach. He will last for many years and he comes with an indoor guarantee, though he can be displayed outside in a sheltered spot. He stands 240mm high and 360mm from end of tail to end of beak, although each one is crafted individually and may have slightly different dimensions. About ALL of our creatures: They are very light for posting. They are not at all fragile. They will last for years and years. They come with a guarantee for inside use. They are made from a sustainable resource (NZ harakeke - flax) They are a truly unique kiwi-made gift just waiting to surprise someone you love! Contact thecaretaker to enquire about payment or shipping options.